Tender Touch Senior Services is an agency providing in home, non-medical care for senior adults, helping them to live safe and secure in their own home for as long as possible. 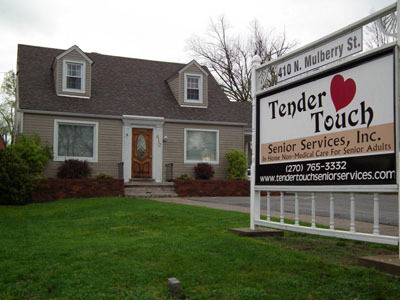 Tender Touch was started in August of 2003 with a deep desire to provide affordable, quality care to senior adults in our community and the surrounding areas. The focus of this agency is "Improving the Lives of Senior Adults" and the commitment of this business is to continue each day to seek better ways to provide quality, professional care to senior adults. Tender Touch Senior Services provides companionship, shopping, transportation, light housekeeping, meal preparation, laundry, medicine reminders, personal care and customized services to fit the specific needs of our clients. As senior adults need a little care to help in the daily demands of everyday living, so do those who care for their loved ones as they age. Respite care providing needed rest from the demands of caring for a loved one at home can be scheduled with Tender Touch as well as respite care in a facility such as an assisted living, nursing home or hospital. Included in the services offered, Tender Touch also can provide more extensive care in the home, helping with activities of daily living, such as bathing, dressing and toileting, 24/7 care and helping with end of life care. It is the desire of each person on staff at Tender Touch Senior Services to provide the very best care possible to all those who call on our services. Dona and Roger McCurry are owners of Tender Touch Senior Services and Care4Ever Senior Care Center in Elizabethtown, KY. Dona started the business in August of 2003 with a brochure, business license and a deep desire to help senior adults. She has a degree in Recreation with an emphasis in therapeutic recreation from Georgetown College in Georgetown, KY. Dona's husband, Roger, has been a minister for over 36 years and has recently started working full time in his travel business, Koinonia Travels and Tours, after almost 30 years at Severns Valley Baptist Church in Elizabethtown. They have 3 grown children who are teachers and coaches in local schools and are blessed with 2 daughters-in-law and 4 granddaughters. At an early age Dona learned love and respect for senior adults through her grandparents and elderly family members. Through the years, this passion for senior adults grew as she and her husband worked with the senior adults in the church. As Tender Touch Senior Services has grown and been blessed, it has gone from an in-home office to an office building on a busy street, from 1 employee to almost 90, and in July of 2009, has added a senior adult day care, all in the desire to help senior adults live independently with dignity and respect. Get in touch with us today for more information about our senior home care services!